For decades, Sir David Attenborough has brought viewers both the beauty and the struggles of the animal kingdom, documenting the lives of creatures we may never see in the flesh, with the empathy of a novelist. Generations of viewers have been moved to tears at the trials and tribulations of the extraordinary animals captured by Sir David’s iconic camera crew; beings who’ll never know the viral fame and emotion they inspire. Cosy in our living rooms, we’ve gasped in terror and admiration as mother lionesses fight to protect their cubs, and have been left distraught as plucky young gazelles are reduced to a cheetah’s breakfast. Who could forget the regal David the Chimp being violently betrayed by his plotting subjects in Dynasties? Or the warring giraffes locked in ferocious battle in Africa? Such moments provide more drama than anything a human scriptwriter could dream up, with birth, death and everything in between captured in exquisite, heart-rending detail. Sir David’s latest documentary series, Our Planet, is yet another triumph. The eight episodes span continents and species with extraordinary visuals, and the gentle, ever comforting narration of Sir David himself. Ideally, we’d all love to see a series which delves into the rich variety of the animal kingdom, predators and prey alike thriving and surviving in the lands of their ancestors. However, in this day and age such a doc would be a dangerous revision of reality; going against everything the 92-year-old natural historian and passionate environmental educator stands for. Climate change is already affecting every living creature on the planet, causing death and destruction on a truly devastating level. And it’s this crucial issue which guides and shapes Our Planet, Sir David’s most heartbreaking and unrelenting exploration of climate change yet. #ourplanet the tag adds a walrus for good reason. 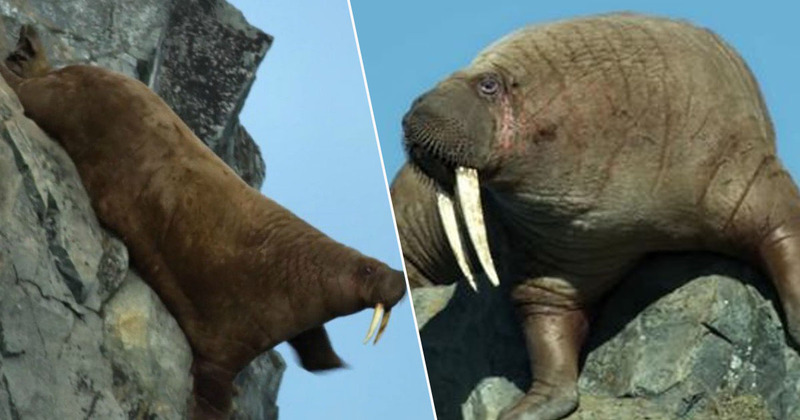 giant walruses fall to their deaths off cliffs they never should have been on, you see tusks being broken; imagine the sheer force of all that weight dropping 80m onto sharp rocks because humanity has failed them. Our Planet has given us some extremely troubling moments, which should quite rightly tug on our collective conscious. And those who’ve dismissed such moments as ‘just nature’ have missed the point entirely. Viewers have seen a seal unable to protect her pup from predators due to a lack of ice to cover it with. We’ve seen lush, life giving forests eaten away with alarming speed and gorgeous coral reefs left in bleached ruins. But undoubtedly the most disturbing moment of Our Planet – and indeed of any nature show I’ve seen – is the one which shows the walruses tumbling to their deaths from a steep cliff. They shouldn’t have been up there in the first place, but shrinking sea ice had left them stranded and confused, away from the ice floes of their natural habitat. The Walrus lost its habitats. The climate change is really happening. During what was an almost unbearable scene, the poor sighted walruses – sensing other walruses at the bottom of the cliff – fell from the great height, unaware they would be fatally injured. They do so out of desperation not choice. Their natural home is out on the sea ice, but the ice has retreated away to the north and this is the closest place to their feeding grounds. Every square inch is occupied, climbing over the tightly packed bodies is the only way across the crowd – those beneath can get crushed to death. In a desperate bid to avoid the crush they try head towards the cliffs. Speaking with The New York Times, Our Planet director and producer Sophie Lanfear admitted, ‘the walrus scenes were the hardest things I’ve ever had to witness or film in my career’. This is indeed a brutal watch, but a necessary one. Especially in an age where many people are still comfortable – and even take pride in – positioning themselves as climate change deniers. We admire Sir David for his ability to show us the beauty of planet Earth, but it’s his ability to reveal the ugliness which threatens us all which will be his lasting legacy. From over-fishing, to industrial agriculture, to carbon use, Sir David gives us footage which hits harder than the headlines. Our Planet is working wonders in showing people the beauty of the natural world as well as showcasing some of the ways in which wildlife struggles with adversity. Some of this hardship is of course a part of the natural cycle of life, but far too much is unfortunately down to the way in which humans are treating the planet. There is an urgent need to avoid the worst impacts of climate change by stopping burning fossil fuels. We can help oceans, forests and the creatures that live in them to withstand the impacts they already face by putting large areas off limits to human activity so that wildlife can survive and thrive. It may be more comforting to consider our world as full of fluffy, well-fed polar bears and healthy, roaring lions. We may want to see pristine snow gleaming and oceans teaming eternally with colour and life. We take such things for granted, believing there’ll always be more time to correct the wastefulness of human beings; believing the next generation will do more. However, as Our Planet so harrowingly illustrates, the time to act is now. Director of Science at WWF, Dr Mark Wright, acted as the science advisor for Our Planet, with WWF being involved throughout the production process alongside Silverback Films. Our world is under threat like never before from issues including climate change and nature loss. What is happening in the Arctic is nothing short of a crisis and the world needs to wake up and act. Sea ice, which Pacific walruses depend on, is in decline and is one of the most visible signs of climate change on our planet. And it’s not just crucial to Arctic people and species like polar bears and walrus, but to the health of the planet as a whole. But there is still time to put the world on the path to a better future, if we act now. The Our Planet series will help raise awareness of some of the most significant issues affecting our world, but it also aims to inspire people to demand that global leaders act urgently to tackle these threats. The solutions are at our fingertips – but what we’re missing is the political will to deliver them in time. That is why we need to make our voices heard and fight for our world. Let’s not view the walrus death scene as simply another upsetting instance of life in the wild. In no way could these deaths be described as natural, and our sadness cannot be mitigated by the knowledge we’re watching the circle of life in action. Those walruses – with their innocence of the world beyond their herd – were never meant to fall from that overcrowded cliff; their mighty bodies left in broken heaps on rocks they were never equipped to navigate. Walruses are unable to fight the battle for their diminishing habitat. But we – as human beings more interconnected than ever before – are fully capable of taking action.